We appear to have our first major preseason injury, and it couldn’t happen to a worse team. 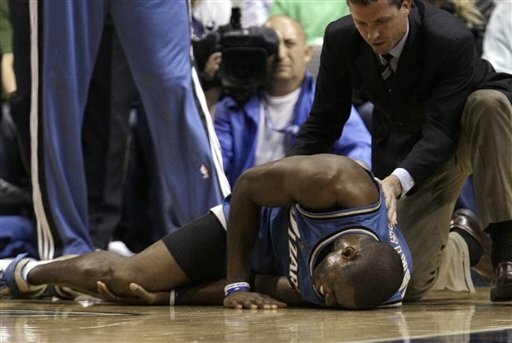 Antawn Jamison suffered a right knee injury in Monday night’s preseason game and had to be helped off the floor by his teammates. He clearly benefited statistically from Areans’ absence last season and poised for a similarly big start to this season. Now, perhaps his entire season is in jeopardy. In addition, Wizards center Brendan Haywood is visting hand specialists and may need surgery that would put him on the shelf for six months. And Caron Butler and Andray Blatche keep inching up everyone’s draft board…..